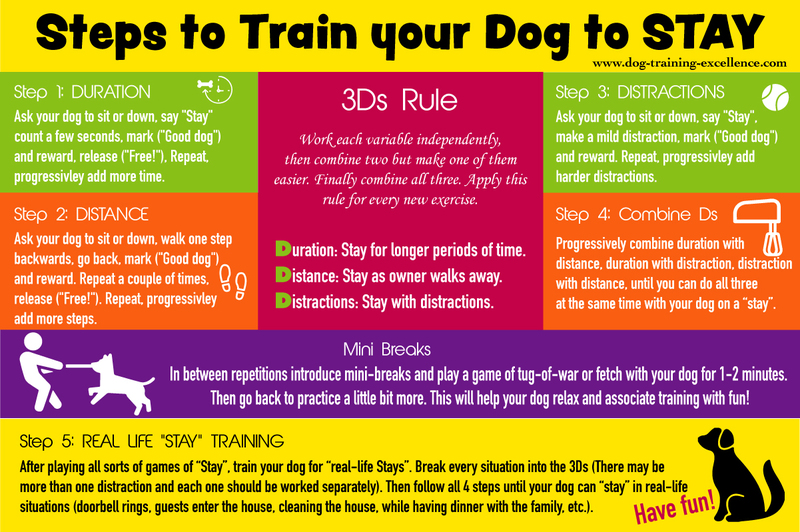 Training your dog to stay is easy, fun and very useful. Your pooch should know how to sit, down and stand before you teach him the stay command. What can you use the command "Stay" for? Oh so many things! 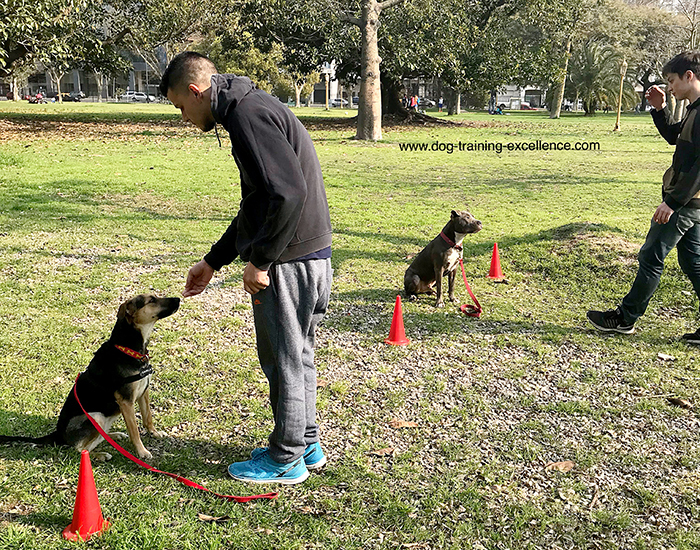 Training your dog to stay is an ongoing exercise that you may have to practice in different places, with different people and with a variety of distraction. The more you practice, the better your pet will do. Find a quiet place and start training your dog to stay when he/she is relatively tired. This is one of those rare cases in which I will tell you it's OK to start using the verbal commands "Stay" and "Free" from the beginning. But, do not say the word STAY more than once! Otherwise your pet will learn that "stay" doesn't mean anything but "Stay..Stay...Stayyyy" means stay! An alternative is to avoid using "stay" altogether, instead teach your dog that when you say sit (or down, or stand, or any other cue), he must remain in that position until you release. 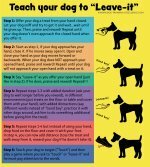 I personally like to use the word (or hand signal) "stay" because I am likely to leave my dog in that position without a release word (forgetful me!) which will only teach my dog to get up whenever she wants to. By using the word "stay" I make sure I say it only when I really mean my dog to stay in a specific spot. Stay: Your Pooch must hold the position he/she is in (like sit, down or stand). The hand signal is usually showing your palm to your dog as in "stop". Tip: If you are training a family dog (not a dog for obedience competition or service work) then it's OK if your dog changes position (for example from sit to down) as long as he stays in the same place. Free: Your pet can now break the stay. You can use any other word you like (OK!, Release, Done!, etc. but pick one). For a hand signal you can move both hands up and to the sides as in "all done" in American sign language. Tip: Your dog won't know the word "Free" the first few times, so he may stay in place after you say it. Just wait and do something different. With many repetitions he will get it! Of all the training gear they sell out there, I highly recommend you get a training treat pouch. They are often inexpensive and you will use it all the time! This one is the one I use, it is designed to stay open for easy and fast access to treats, but it can be closed in a snap to prevent a mischievous dog from getting all the bounty! Duration: Stay for longer and longer periods of time. Distance: Stay even if the owner walks away or even disappears from view. Noticed the 3 D's? We actually call this the 3D's rule. When you beging training a stay, pick just one of those variables and work on it alone. For example, you should never ask your dog to "stay" while you walk 3 steps away and count to 5, not in the beginning any way. Start with one variable at a time, then work with two variables (but make one easier), then add another and so on and so forth. As always, the slower you advance, the faster your dog learns. Let's start with "duration", the easiest variable to work with. If he stays in the same position after another 1-2 secs, give another treat. Repeat 3 to 5 times but randomize the time in between treats. If your dog is new at this, don't go over 5 seconds yet. 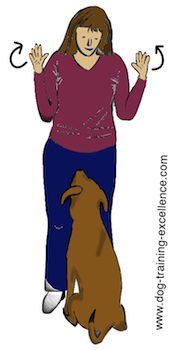 When you are ready to finish the exercise say your release work "Free" and move away from your dog. Take a mini-break (maybe play tug for a few seconds) and start over. Slowly add more time in between treats until you can stay for 30-60 seconds next to your dog in a stay position for only one treat. Tip 1: When you start increasing the amount of time in between treats do it in a random manner and never increasing the time in a linear ways. For example, 2 sec, 1 sec, 5 sec, 3 sec, 2 sec, 3 sec, 5 sec, 1 sec, etc. This won't matter in the beginning, but when you start adding more and more time, if you only increase linearly (1 sec, 2 sec, 3 sec, etc. 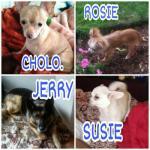 ), your dog will eventually catch on and get frustrated that the following repetition will always be more difficult. 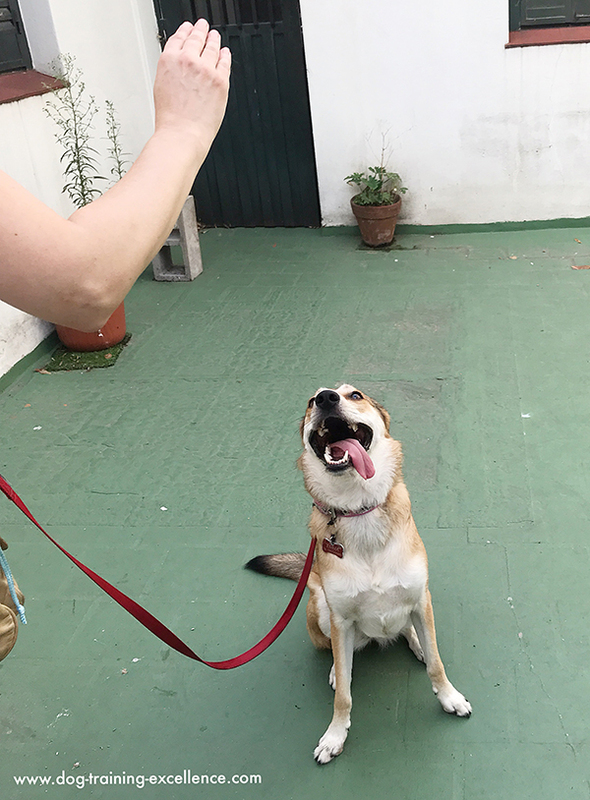 Tip 2: If your dogs moves away after a treat (or in the middle of the exercise), try to give him several treats in row. The idea is to communicate that if he stays he keeps getting treats. You could say a word such as "HaHa" to communicate that he made a mistake and no treat is given before you start again. 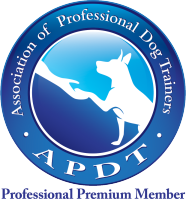 Tip 3: Remember that you are actually teaching your dog 2 words, don't forget to say "Free" when the exercise is over! "STAY" is a concept. Your dog must eventually understand that "stay" means "Do not move from that spot until you hear the word "FREE". The first few steps should be effortless to your dog because he will be getting lots of treats in a short ammount of time. However, as we advance this skill, your dog must understand that "STAY" means "Do not move from that spot, NO MATTER what happens around you, until you hear the word "FREE". The first difficulty for your dog will be getting praise and rewards while staying! Make it clear that praise and Reward! do not mean that the exercise is over. The stay is only over when you say "Free"! Your pet will learn this through trial and error. To help him, stay consistent! You can move on to the next step when your dog can sit or down stay for up to 10 seconds (without breaking the stay) 8 out 10 times you practice! This is the second "D" and should not be practiced with added duration in the beginning. Take one step away from your dog - Immediately go back to your dog, praise and treat! Repeat 2 or 3 times only moving 1 step away from your dog. Then, add 1 or two more steps. If your dog moves with you, say "HaHa" and place him back in his place to start over. If your dog can't understand it, then instead of one full step back, just move one foot a little bit - Praise and reward! Repeat until your dog relaxes enough for you to move one step away. When you are ready to finish the exercise say your release work "Free" and move away from your dog in a "we are done for now manner". Slowly add more steps in between treats until you can walk 10 steps away fro your dog for only one treat. Tip 1: Walk away from your dog, but facing him. Turning away from your dog counts as an added distraction and most dogs can't successful do it the first time they are learning "stay". You can move on to the next step when your dog can sit or down stay for up to 30 seconds and independently stay while you walk 10 steps away (without breaking the stay) 8 out 10 times you practice! Step 3: Make it a game! Now that you are training your dog to stay with duration and distance you can start combining the two. Make it a game and take it to different places! How far can you get away from your dog? Can you walk around your dog? How many Jumping-jacks can you do with your dog on a sit stay? Can you count out loud? How many numbers before your dog gets-up? Can turn around? jump in one leg? Tip 1: When you combine two variables (duration + distance) make one of them easier. For example, your dog can stay for 30 seconds and independently stay while you walk 10 steps away from him. Now, walk just one step away and count to 10 then praise and reward! Slowly reach your goal (10 steps away + counting to 30 away). Always think about your pet's safety. If you think your pooch may run away while training, use a hand's free leash to practice in public places. A fun distraction to try is to work with 2 or more dogs at the same time. As mentioned in the steps before, try to ease the other two variables when you add a distraction. Distractions are anything and everything that ... distracts your dog! "Distractions" is a large category of exercises. So, I will give you one example for you to follow with all other distractions. Slowly move the toy from your chest to your belly, if your dog is still sitting, praise and reward! - Repeat a few times then release "Free!" Slowly swing the toy from one side to the other, if your dog is still sitting, praise and reward! - Repeat a few times then release "Free!" Slowly add more movement or place the toy on the floor. Progressively making it harder and harder until you are able to toss the toy with your dog remaining on a stay. 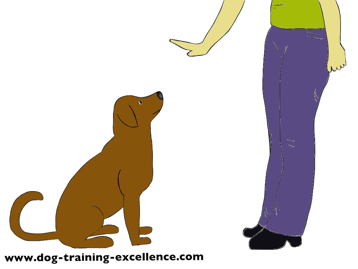 Tip 1: If you see that your dog is failing more than succeeding try to think of a way to make the exercise easier. The goal is for you to reward your dog for small victories. 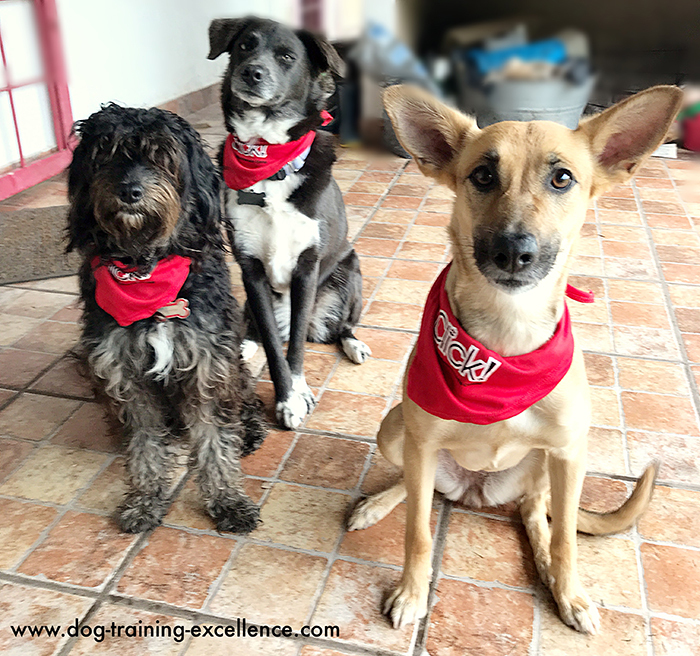 Step 5: Combine all "Ds"
Dogs learn better when each aspect of a behavior is trained separately and later on combined together. When training your hound to stay with distractions you had to lower the criteria each time. When you combine three or more aspects you need to relax your criteria too! If your dog can sit stay for 60 seconds while you walk 5 feet away, he most likely will NOT be able to do the same while there is a ball rolling on the floor or another dog playing close by. To train this you need to start with a few seconds and a few steps away while the distraction is happening. Start at whatever combination your dog is likely to succeed! After training many behaviors in different locations, with different distractions and at different distances, your pet will start "getting" things faster! Eventually you will find yourself in a completely new situation that your dog can master without previous training! Make it a game though, see how many goofy things you can do while your dog sit-stays or down-stays. Laugh and have fun together! Training your dog to stay is done! Well, not really...training your dog to stay in real situations is the final step. I hope you got the idea that up until now you should have been playing "stay games" with your dog. This will ensure that you and your dog have fun training instead of being a chore. Now that your dog understand the concept of stay in a fun and positive way, it's time to use it for "real-life" situations. Always keep in mind that dogs can't generalize concepts, so your "stay-games" won't make your dog stay when the door bell rings. You can, however, teach your dog to stay when the door bell rings as a separate exercise. Each real-life situation that you plan to ask your dog to stay, you must train it first. To train a real-life stay try to think about each component f the exercise and train each one separately (like we did before), then progressively add them together. Duration: How long does your dog need to sit-stay while you answer the door and greet a visitor? Distance: How far away from the dog are you planning to leave your dog from the door? Distraction 1: Sound of keys alone and/or while opening the door. Distraction 3: You crossing the door threshold. Distraction 4: The sound of the doorbell. Distraction 5: A stranger outside the door. Distraction 6: A stranger entering your home. Distraction 7: More than one stranger entering your home. Distraction 8: A stranger coming inside with bags, umbrellas or hats. For your dog to succeed, work each variable independently. If you have been working on the previous exercises, then duration and distance should be fairly easy for your pooch. When you add each of the distractions, start with your dog close to the door and progressively have him stay further and further away. For the most difficult distractions (doorbell sound, stranger outside the door), you may have to start very easy. I highly recommend you recruit a friend or family member to help you practice this. Their job would be to ring the bell at variable intervals and in a different session, to enter the home, greet you, greet the dog (who should remain on a sit-stay), then go back out and repeat as many times as it's necessary for your dog to get it! Sounds like a lot of work? It is, but if you do it right, your dog will know what to do when visitors come to the house. If you haven't done so yet I strongly suggest you start by reading the following articles, then come back here: 1) Marker Word, the first thing you should teach your dog, 2) How to get a reliable dog command, 3) Training your dog to sit, 4) Training your dog to lay down, 5) Training your dog to stand. You do not have to train your furry friend to the last step. When you are happy with your dog's response you can stop there! I organized Steps in a logical order but you can mix them up however you want to make things more fun! When combining two difficulties together (for example: Sit stay in a new place), your pet's response might be worse in the beginning. He will get better with...Practice practice practice! To keep training sessions fun use food treats, toys, games, petting and anything else your dog enjoys as rewards. You do not have to set specific training sessions. You can train your hound at any time! Use his/her regular feeding food to get a few trials of practice before you put the food bowl down. Ask him to do something before you throw a ball for him/her. If your pet is failing go back down a step or make your criteria easier! You want your canine friend to succeed every step of the way! Ready to train some more? Target training is a super easy cue that can be helpful in many different situations. Try it! Leave-it! This cue will prevent your dog from grabbing things from the floor (like things you drop or unsafe things from the street. Don't know what else to teach your pooch? 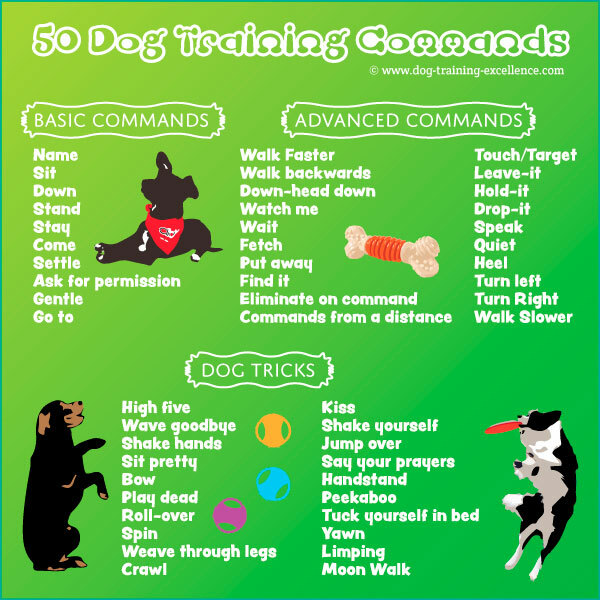 Look into our list of 50 dog training commands!